Orientation in Fernando de Noronha. Give yourself 5 minutes to read this and you will understand Fernando de Noronha orientantion and whereabouts. 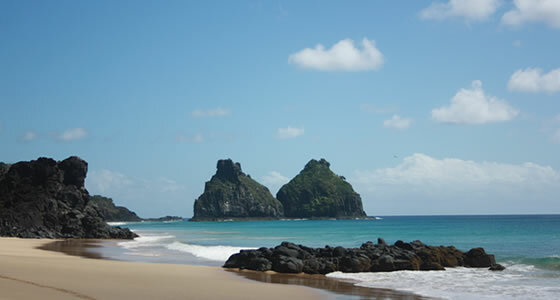 The Fernando do Noronha archipelago consists of 1 large island and several smaller rocks and islets. The large island is the where the 3,000 year round residents live. Most are connected to the tourist trade as this is the main means of income for the residents. The island is surrounded by beaches and several large rock walls. In the center of the Mainland is the Fernando de Noronha Airport. Flights from Recife and Natal arrive daily bringing tourists to the islands. The airport also accepts flights from other cities in Brazil. There are two historical sites on the island, Vila dos Remedios and Village Quixaba. Ten forts were built on the islands (9 on the mainland) and some are still visible including Fort San Pedro Boldro, Fort of Nossa Senhora da Conceicao and Forte de Santo Antonio. Also on the island are a School and Hospital as well as a power plant, waste treatment plant and water treatment plant. Vila dos Remedios is the original settlement and is made of old colonial houses, an old prison and an 18th century fort, Forte dos Remedios. It is located on the northeast portion of the island. Quixaba was the second settlement on the main island. It is 6 kms(3,7 miles) from Vila dos Remedios on the western side of the island. Villa do Trinta is southwest of Vila dos Remedios and due north is Floresta Nova and northwest of Floresta Nova is the neighborhood of Floresta Velha. On the southeast portion of the island is Vila do Sudeste. Most of the beaches are either on the west side of the island facing the Brazilian coastline or on the east side of the island facing Africa. On the west side starting at southwest section of the island is Dolphin’s Bay. Moving northeast travelers would next see Sancho Beach followed by Pigs Beach. Due west of Pigs Beach is the small islet Ilha Dois Irmaos with its beach Praia Cacimba do Padre. Back on the mainland the next beaches in order are American Beach, Boldro Beach and Cachorro. At the tip of the northwest portion of the island is Porto Sto. Antonio. Moving clockwise around to the eastern side of the island Atalaia Beach is followed by Praia Do Sueste and then Praia do Leao.